Breakfast is the most important meal of the day and we love enjoying a big breakfast on the weekend, even during the warmer months. Although we've finally got out of that long, cold winter we experienced earlier this year, one of the best things about all of those snow days was being able to enjoy a nice hot breakfast on a weekday. It's no longer cold in Delaware (thank God for the change of seasons), but I still like to experiment with fresh breads at breakfast time. These sweet potato biscuits turned out pretty well. Soft, but not too flaky. Sweet, but not like dessert. I love putting butter on breads, and I know these would be even better with cinnamon honey butter. We served these for breakfast with Neese's sausage (imported from the great state of North Carolina) and grits, but you could absolutely add these to your bread basket for dinner. You start with one cup of cooked, mashed sweet potatoes. It took two medium potatoes to yield this amount. I cook my potatoes by scrubbing, pricking with a fork, and microwaving for 8-10 minutes. You could use canned sweet potatoes, but I think they'd be sweeter with all the syrup used in canning. Use what you have, though. These tender biscuits are just sweet enough and I think they'll make you smile. Yes Lord! My great auntie used to make these and I loved them with a bit on honey cured ham! I'm gonna try this out! Thanks! A biscuit that makes me smile? yes please! 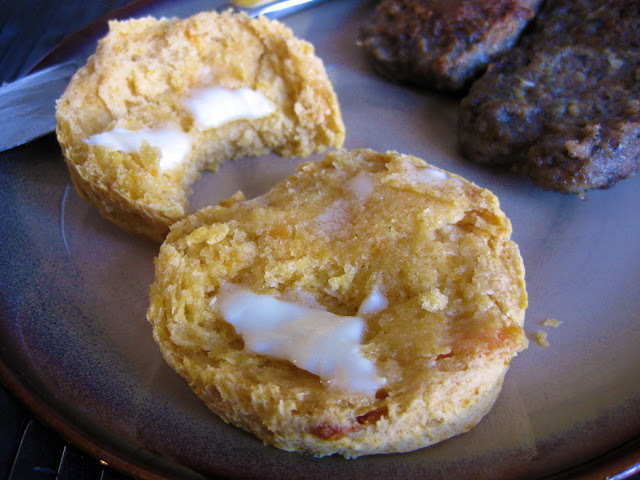 I remember my first attempt at sweet potato biscuits. I had such high hopes for them and they came out flat and brick like. utter fail. But that was many moons ago. It might be time to make them again. Glad they look yummy to you! They are so easy to make and really good... just try some cinnamon honey butter on 'em. They look good and I love sweet potatoes. Btw, I love how you change up your profile photo. You're very photogenic.